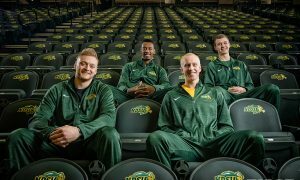 Senior Columnist Josh Swanson and Editor Nolan Schmidt are joined by former Bison basketball player Dexter Werner, who will play professionally in Luxembourg in 2018-19. Senior Columnist Josh Swanson and Editor Nolan Schmidt are joined by former Bison basketball player Dexter Werner. After playing professionally in Germany last season, Werner recently signed a contract to play in Luxembourg in 2018-19. You will not want to miss this exciting edition of the Bison Illustrated podcast.